Yogurt cake is the first cake French kids learn how to make usually in the last year of Kindergarten or the first year of elementary school. It is very easy to make and the measurements for the cakes are simplified by the use of the yogurt container as a measure. This lets even young children able to help measure, pour, mix and bake the cake. The French school system is actually quite different than its US counterpart. In France, children go to Kindergarten for three year, starting at 3 years old. This is called "maternelle" and is usually broken down between "petite maternelle" (little kindergarten), "maternelle moyen" (medium kindergarten) and "maternelle grand" (big kindergarten). Kindergarten is optional but 95% of all French 3 year old and 98% of the 4 and 5 year old attend it. School is mandatory starting at 6 years old. After Kindergarten, elementary school begins at 6 years old with Cours preparatoir, shortened to CP. Then children attend "Cours elementaire 1" or CE1 followed by "Cours elementaire 2" or CE2. The last two years of elementary school are spent in "Cours Moyen 1" and "Cours Moyen 2" (CM1 and CM2 respectively). By the time kids reach this level, they know how to read, write, count and have been exposed to some history, geography, civics as well as art and music. Some schools also offer early language classes such as English or regional languages classes such as Breton or Basque. At this age, kids attend school all day on Monday, Tuesday, Thursday and Fridays. Growing up, we also had Saturday morning classes from 8 am to noon but this practice was canceled in 2008. I suspect the French government gave in to the parent's pressure to end Saturday classes as it significantly cuts down on the weekend time. At 11 years old, children move up to college, which would be the equivalent of middle school in the US. At this level, grades are referred to by numbers: 6th, 5th, 4th, 3rd. Notice that unlike in the US, the grade levels go from largest to smallest. This is just to add to the confusion (since it was in ascending order in elementary school). After college, the children attend high shcool, le lycee. Classes are then 2nd, 1st and Terminale (which means final class). At the end of the Terminale, students take the Baccalaureat examen which is the equivalent of the US high school diploma but is based on 2 weeks of finals at the end of the year instead of based on the whole year's work like in the US. The classes are also more demanding than in the US. For example, everyone is expected to take philosophy classes and it is part of the mandatory subjects in the baccalaureat. The baccalaureat is the only requirement to attending university classes in France, as most of the higher education universities are public and free to attend. But back to the yogurt cake. As I mentioned before, it is very simple to make. You start with a yogurt, hence the name. When the yogurt container is emptied, you use it as your standard measure for the rest of the ingredients. No complicated weighing and no need for the standard measuring cups. Put the ingredients in the order listed in a large mixing bowl. Combine until you get a dough. I used a spring form pan as it was the closest I had to a cake mold. You could use a brownie pan, a tart pan or even two pie pans if you want to make a two layer cake (spread some jam in the middle - yum!). You can add some cut up fruit or some chocolate chip in the dough for something different. Bake in a 360 degrees oven for about 30 minutes. The cake is done when the tip of a knife inserted in the cake comes out clean. 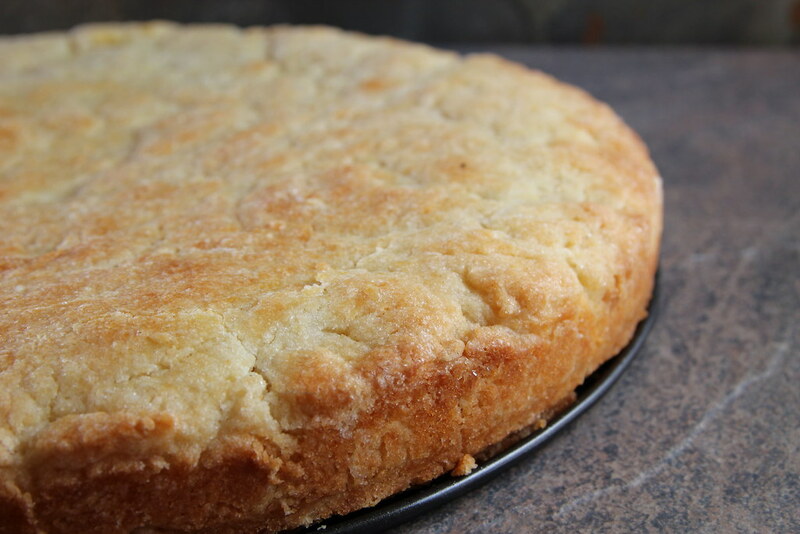 You can serve this cake as is with a cup of tea or with some homemade jam on the side. 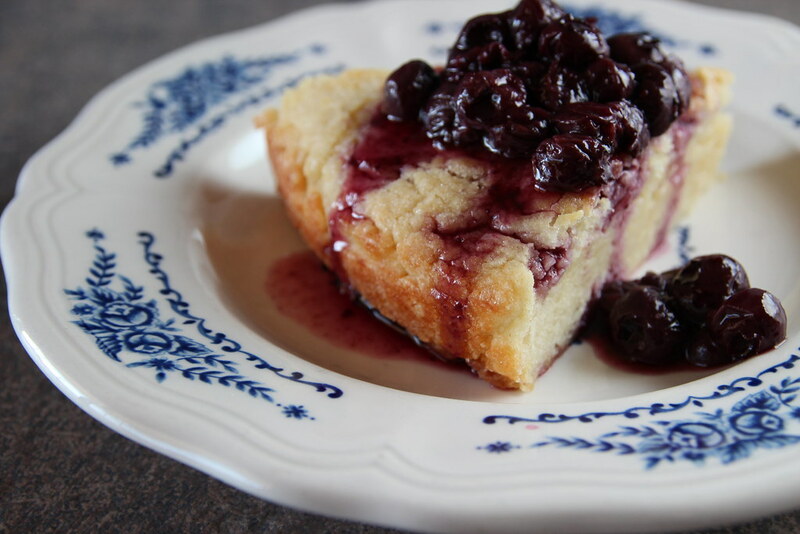 We chose to use some of the homemade blueberry compote we made last summer. It's a versatile cake so enjoy it any way you fancy.